What's behind India's success in the global knowledge economy? One key is a boom in private schools for all. March 6, 2006 issue - I recently got a call from a board member of one of the world's largest consulting companies, who invited me to speak to them about why so many Indians were succeeding in the global-knowledge economy. He mentioned innovations emerging from GE and Microsoft's R&D centers in Bangalore; advanced avionics installed by India's Air Force on Russian fighter aircraft, and sophisticated research on global capital markets outsourced by Wall Street to India. Finally, he rattled off the names of a dozen Indian leaders of multinational corporations. I was skeptical. "Perhaps it's our large population?" I suggested. He countered with half a dozen large countries that are invisible in the knowledge economy. "Or maybe it's simply knowing English?" He asked if there was something in India's education system that might help explain its recent economic success. The best in India do get a decent education. Aside from the famed Indian Institutes of Technology and the Indian Institutes of Management, there are about 20 other centers of excellence in science, engineering, medicine and even the liberal arts. Both students and parents are intensely dedicated. Night after night, middle-class Indian parents insist on overseeing their kids' homework—it's a rare mother who accepts a dinner invitation during exam season. By the age of 15, the young are packed off to coaching classes to prepare them for entry into the competitive colleges. What's changing is the access to quality education below these top levels. Government-run schools are a mess: a national study by Harvard University faculty found that on any given day, one out of four teachers in state-run primary schools is absent, and of those present half are not teaching. But private schools—which can range from expensive boarding schools for the elite to low-end teaching shops in the bazaar—are proliferating. Even the poor now send their kids to private schools, which can charge as little as $1 to $3 a month in fees and are spreading rapidly in slums and villages across India. 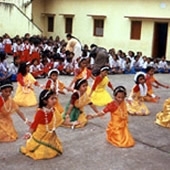 NIEPA, a state-sponsored think tank, confirms that two thirds of the children in urban Maharashtra, Uttar Pradesh and Tamil Nadu—three of India's largest states—are now in private schools. According to National Sample Surveys, spending on education rose from 1.2 percent of per capita expenditure in 1983 to 4.4 percent in 2003. In urban areas it's risen even faster, from 2.1 percent to 6.3 percent. These private schools are delivering results. Although teacher salaries tend to be two-thirds lower on average, Prof. James Tooley of the University of Newcastle found that even unrecognized schools in Hyderabad's slums delivered mean scores in mathematics that were 22 percentage points higher than public schools. A national study led by the education NGO Pratham confirmed that even in villages 16 percent of the kids are now enrolled in private primary schools, and their reading and math scores were 10 points higher. This upsets the Indian left, which wants to shut down these "mushrooming private schools." Bureaucrats take advantage of this prejudice and extract bribes in exchange for licenses, which average 5 percent of a school's running cost. Yet even the children of government-school teachers go to private schools. As with so much about India's success story, Indians are thus finding solutions to their problems without waiting for the state. If China's success is due to its amazing (and state-funded) infrastructure, India's is largely the result of individual initiative. If this initiative can successfully broaden access to and raise the quality of education, India could be even better positioned for the knowledge economy than its behemoth neighbor. Gurcharan Das is the author of "India Unbound" and a former CEO of Procter & Gamble India. SOURCE: © 2006 Newsweek, Inc.